서천 봉서사 목조아미타여래삼존좌상은 아미타여래를 본존으로 관음, 대세지보살이 협시하는 아미타삼존 형식이며, 조선 후기의 예 중에서 이른 시기에 해당한다. 삼존상에서 발견된 발원문(發願文)을 통해 1619년이라는 정확한 조성시기와 조성주체, 시주자 등 조성과 관련된 기록이 전하고 있어 이 시기 불상연구에 기준자료를 제공한다. 이 불상을 만든 수연(守衍)은 17세기 전반기에서 중반기에 걸쳐 활동한 조각승인데, 그는 1615년 태전(太顚)을 도와 김제 금산사 독성상을 제작하였고, 1622년에는 현진(玄眞)을 도와 서울 지장암 목조비로자나불상을 제작하였다. 이후 강화 전등사 대웅전 목조석가여래삼불좌상(1623년)과 익산 숭림사 영원전 지장시왕상(1624년),그리고 예산 수덕사 대웅전 석가여래삼불좌상(1639년)을 수조 각승으로 참여하여 제작하였다. 이 작품은 지금까지 알려진 그의 작품 가운데 가장 이른 시기의 작품이며, 그의 초기의 조각적 경향을 가장 잘 파악할 수 있는 작품이다. 즉 턱이 짧은 넓적한 얼굴에 도톰하게 자리 잡은 넓적한 코, 여기에 짧은 인중과 두툼한 턱으로 중후하면서도 개성이 넘치는 얼굴, 넓고 두툼한 가슴과 긴 허리에서 오는 중량감 넘치는 형태, 강직한 선 위주로 표현한 도식화된 주름이나 왼쪽 어깨나 무릎 아래로 펼쳐진 독특한 형태의 주름 표현 등에서 그의 조각적 경향이 잘 나타나 있다. 이 삼존상은 17세기 전반기 추구했던 대중적 평담미와 수연이 추구한 중량감 있는 형태미를 잘 보여주고 있는 불상으로 평가된다. 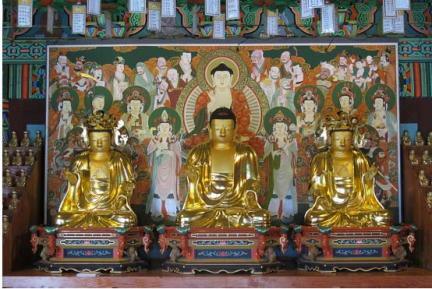 These wooden statues of the Amitabha Triad enshrined in Bongseosa Temple, Seocheon, consist of the principal Buddha, Amitabha, with his two attendant bodhisattvas, Avalokitesvara and Mahasthamaprapta, seated on either side of him. 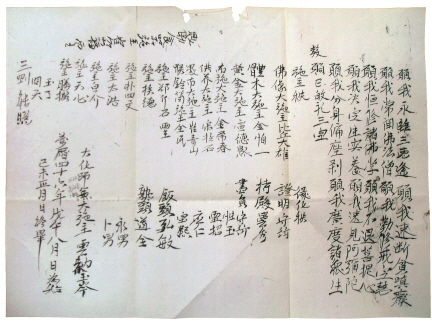 The discovery of a written prayer inside the Buddha triad revealed that it was made in 1619. 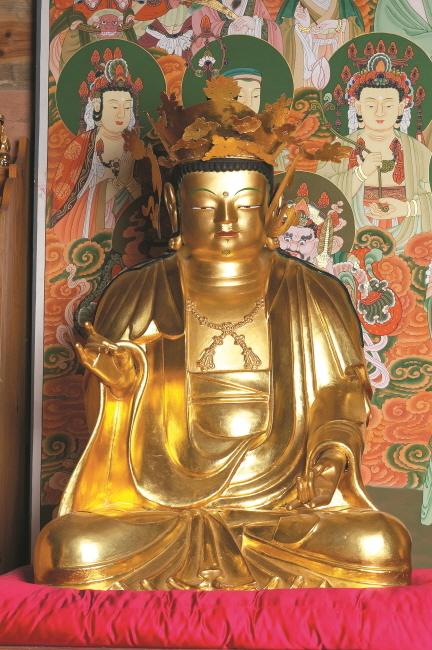 It also contains valuable information about the date and location of its production and the purpose for which it was made, thus enhancing our understanding of Korean Buddhist statues made during the mid-Joseon period. 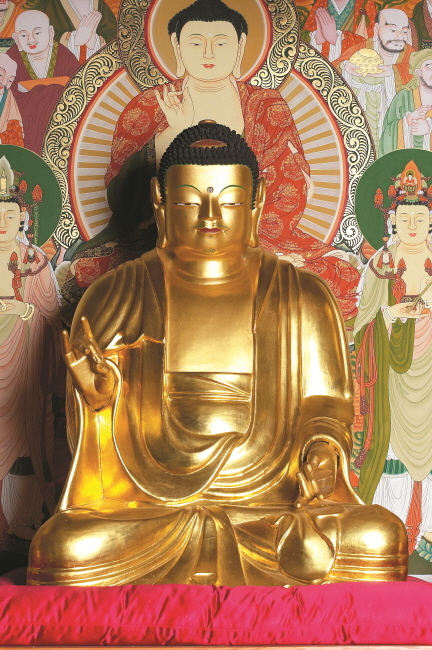 These statues are among the earliest works by Suyeon, a monk and sculptor who was active from the early to mid-17th century, showing characteristic elements of his early sculptures. The statues feature, for instance, a wide face with a short fleshy chin, a rather thick and wide nose, a short philtrum, a broad and thick chest, and a long waist, as well as a stylized expression of the folds of the robe draped from the left shoulder to cover the knees. 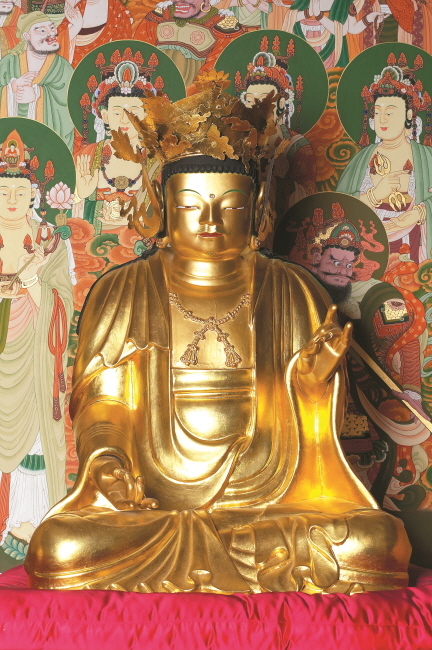 This Amitabha Buddha triad is admired for its delightfully simple beauty combined with a solid form that charmed ordinary Buddhist worshippers of the early 17th century.